On top of this exquisite time piece is two large bronze figures, hinged at the waist. They strike the hours on the bell. 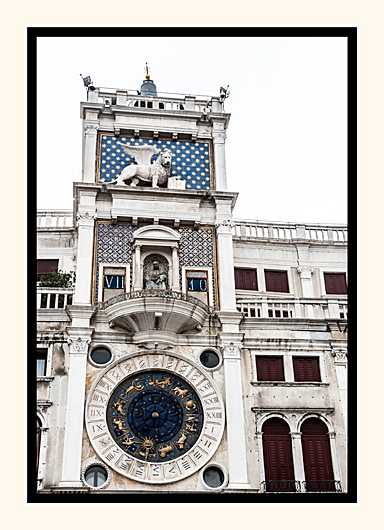 On the facade you have the Lion of San Marco. Then under that you have Magi paying homage to Christ symbolise the Christian faith. And then the clock, which displays the time of day, the dominate sign of the Zodiac and the current phase of the moon. This is truly a beautiful time piece. This is no3 of 3 photos of the St Mark's Clocktower.